Two players currently ranked in the top eight of the 2016 WTA Road to Singapore, Victoria Azarenka and Johanna Konta, will square off for a place in the semi-finals of the Miami Open. The Belarusian showed signs of her very best form in the second set, going up an early break with back-to-back return winners. Muguruza, fighting hard, hung around and got back on level terms. Azarenka failed to serve out the match at *5-3, saving two break points, then missing two match points (two winners from Muguruza) and finally losing the game with Muguruza benefiting from a fortuitous net cord. Azarenka was a little rattled but showed her mental strength, getting to the tiebreak. From there, she took control once more with Muguruza producing a costly double fault and some errors long. Konta is zoning in on a spot in the top 20 by virtue of reaching her first Premier Mandatory quarter-final. The Brit has come such a long way, as demonstrated by her two most recent wins in Miami. In the third round, Konta was two points from defeat against Elena Vesnina but was so, so tough, playing three fantastic points down *5-6 *15-30 in the third set – two backhand winners and outlasting Vesnina with a crazy point up at the net. Konta kept it together to win the third set tiebreak and prevail, 4-6 6-1 7-6(3). In the fourth round, Konta had her tactics spot on in a 6-2 6-2 victory over Monica Niculescu. The Brit was aggressive, coming forward behind the serve and neutralised all the things that make Niculescu so tricky to play. Konta was an impressive 23/31 on net points won and kept it clean, hitting 32 winners to 30 unforced errors. The Brit had a stumble serving out the match at 6-2 *5-0 with a little bit of tension, but equally, Niculescu finally stepped in and was playing more aggressively. Konta dug out of a *0-30 hole in the final game and won four straight points, closing out the match with a backhand winner down-the-line. Vika Power! Azarenka takes down Muguruza 7-6, 7-6 in a phenomenal match. Head-to-head record: In their only previous match, Azarenka was forced to retire in Wuhan, down 4-6 0-1. 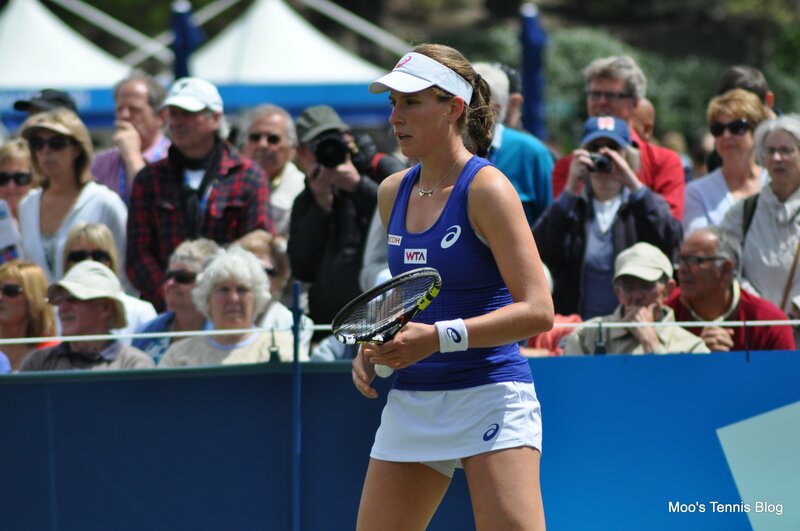 Interesting stat: It took Konta until June last year in Nottingham to win her first match on the WTA tour in 2015. Already this year, Konta is at 13 main draw wins and has plenty of room to improve the ranking up to Wimbledon.